Selecting a book that is appropriate for your learner is very important to hooking them to become readers. 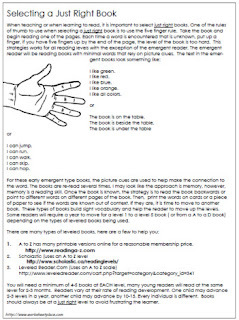 This is a great printable to provide to parents who need to determine what types of books to buy their children. Finding a just right book is important at home as well as at school. Selecting a just right book is essential to motivate a reader to improve and to ensure the reader isn't frustrated by reading a book that is too difficult. A just right book stretches the reader to learn new words and enhances comprehension skills. A good rule of thumb to follow for a just right book is to use the 5 finger rule. Select a book, open it and begin reading, put up a finger for each word that isn't understood, if 5 fingers are up during that first page or two, the book is too hard. 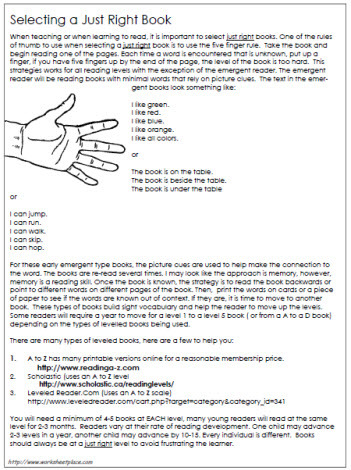 For more information about leveled books and just right books, check out the full article. Currently, I'm enjoying the summer holidays. However, when you're an educator, it's hard to shut the mind off from thinking about teaching, teaching strategies and of course, student learning. Have a great week educators!